Now first things first, I need to apologise for the rapidly deteriorating photo quality as we progress through the weeks of GBBO baking. 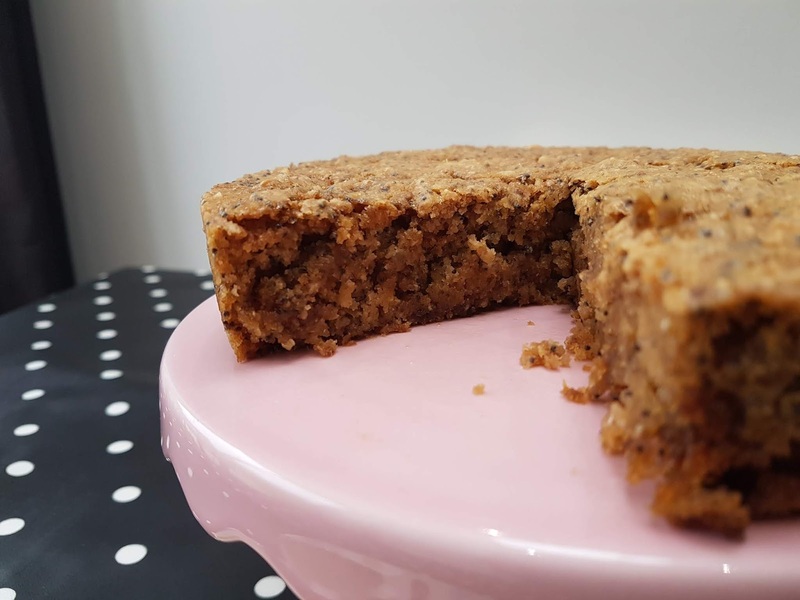 This year I'm finding that the only way I can seem to find the time to bake along each week AND do a write up on the blog is by taking very quick snaps on my phone and then uploading them directly to the blog. Which is why you've probably noticed that some of the photos are even a bit topsy-turvey where I haven't had time to even change the orientation from portrait to landscape or vice-versa. So I seek forgiveness for the photos but at least I'm here and joining in! My heart filled with fear at Vegan week because of the thought of baking without eggs or butter. But when I started to think a little more about it, it turns out that I've baked quite a few vegan bakes before...One of my most used recipe books is Henrietta Inman's Clean Cakes and whilst my primary purpose of making those recipes was to find alternatives to refined sugar and to try some gluten-free bakes, ALL of the recipes in that book are actually dairy-free too. Many of them are also free from eggs too and therefore those recipes are vegan. as well as several other recipes from that recipe book that have never made it onto the blog like fudge made from beans!, buckwheat florentines, an apple pie which I adapted from the blueberry galettes recipe, roasted root vegetable tarts with spiced sesame crust (these are made with a delicious cashew bechamel), tomato and pepper pisaladiere and probably loads of other recipes as I really do use that recipe book more than any other! So as tempting as it was to blog one of these previous recipes, I actually wanted to have a try at something new. 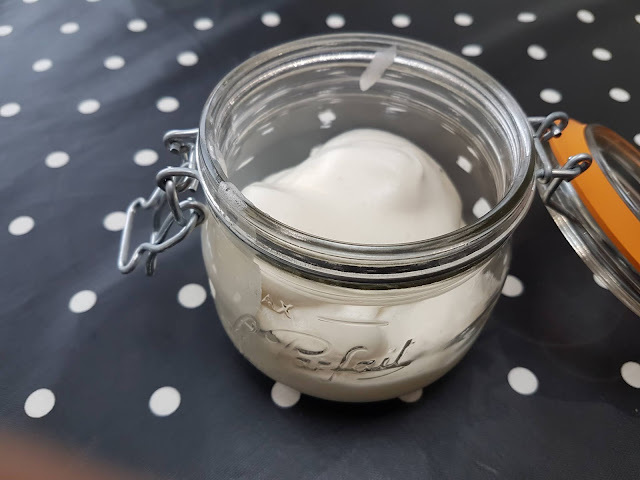 Since I first came across the whole aquafaba thing a couple of years ago, I've been keen to give it a try and even saved my chickpea liquid on a few occassions to do so, but then the doubts crept in and I'd end up binning the liquid. But seeing how successful the aquafaba pavlovas turned out on bake off this week, I decided I really did want to do something with aquafaba. 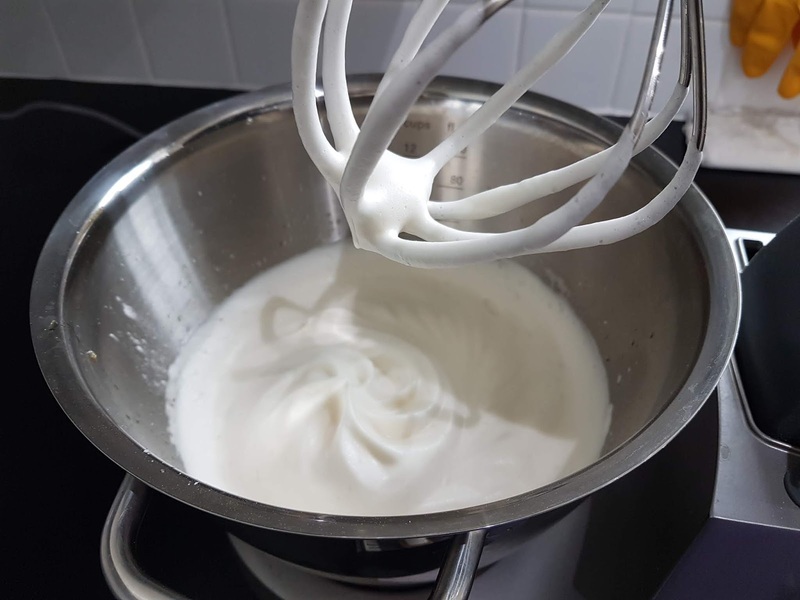 So when I came across this vegan marshmallow fluff recipe on Chocolate Covered Katie, I knew that was what I wanted to make. Yet marshmallow fluff alone doesn't really qualify as counting as a bake! So then I turned to my fridge for inspiration. It is very rare for any food to go to waste in my household - I'm forever cooking, freezing, drying, preserving, so that nothing rots. 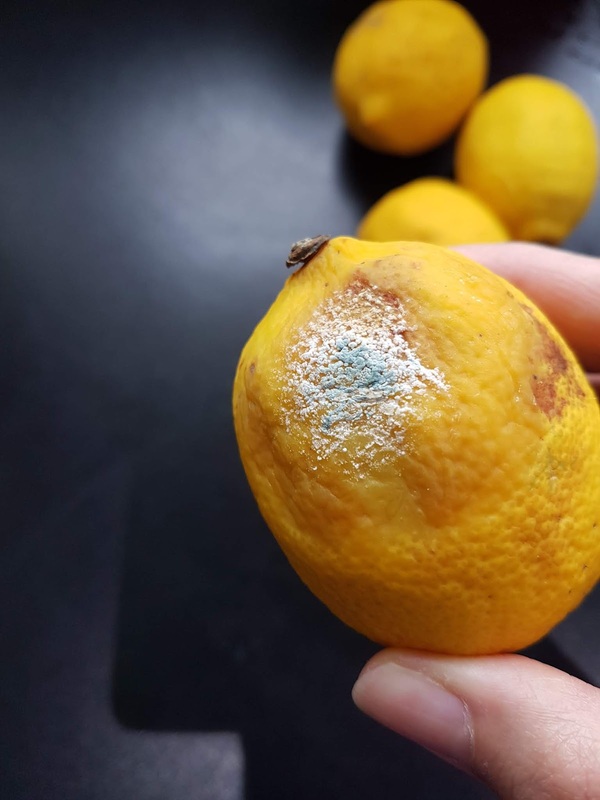 Yet to my dismay I found one of my lemons rotting. So I knew I had to use the rest so they didn't turn bad. 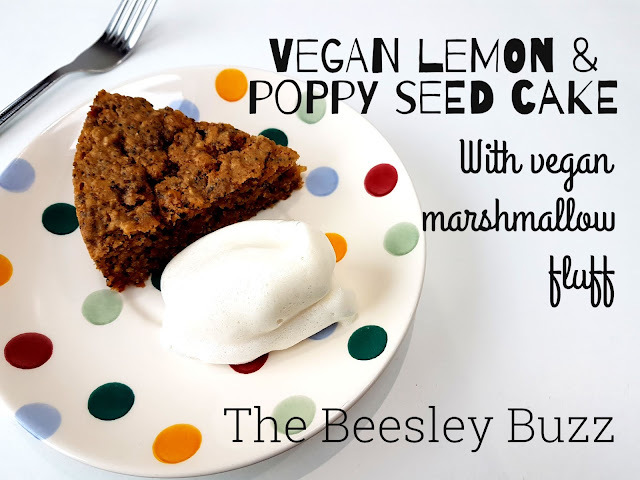 As lemon and poppy seed cake is one of my favourite flavours, I decided to attempt a vegan version of it! I found a great recipe here so I used that as a starting point and changed some of the ingredients to suit me better. 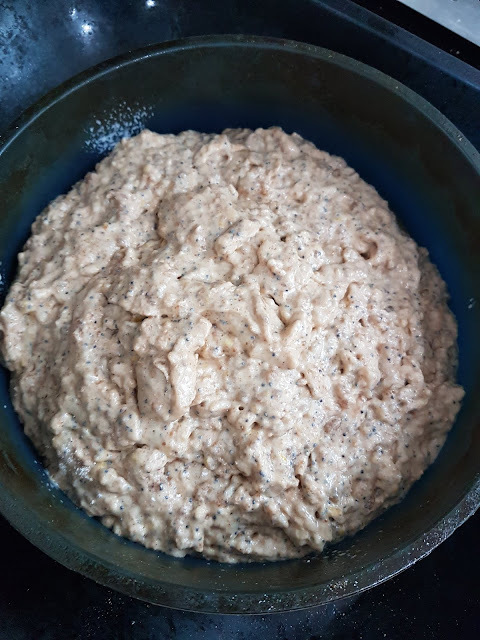 The chia seeds act as an egg replacer in this recipe so whisking the above ingredients together and leaving them to thicken for a while will help in place of eggs. 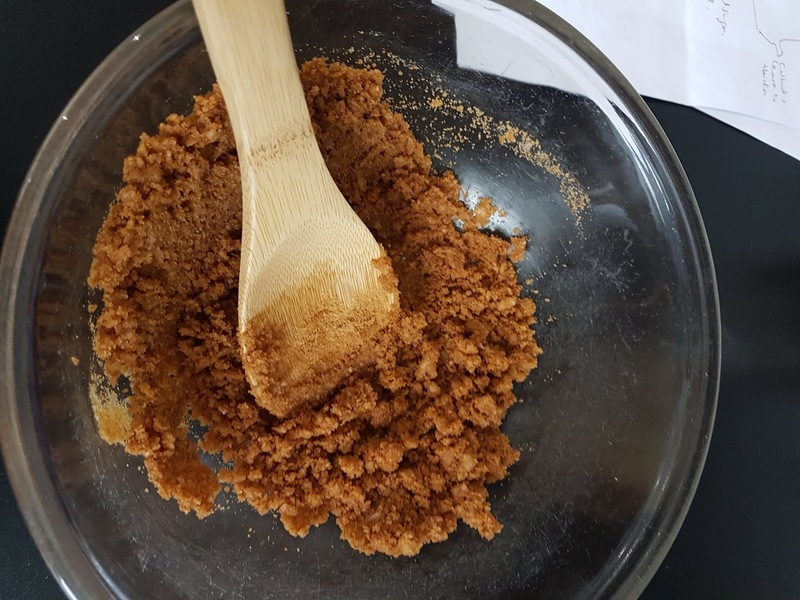 Next I used 80g coconut oil and 100g coconut sugar and creamed it together. Then this mixture is to be mixed with the chia mixture. At this point it went quite lumpy as the coconut oil became more solid-like as it got chilled by the hazelnut milk. In a separate bowl I mixed together the flour. 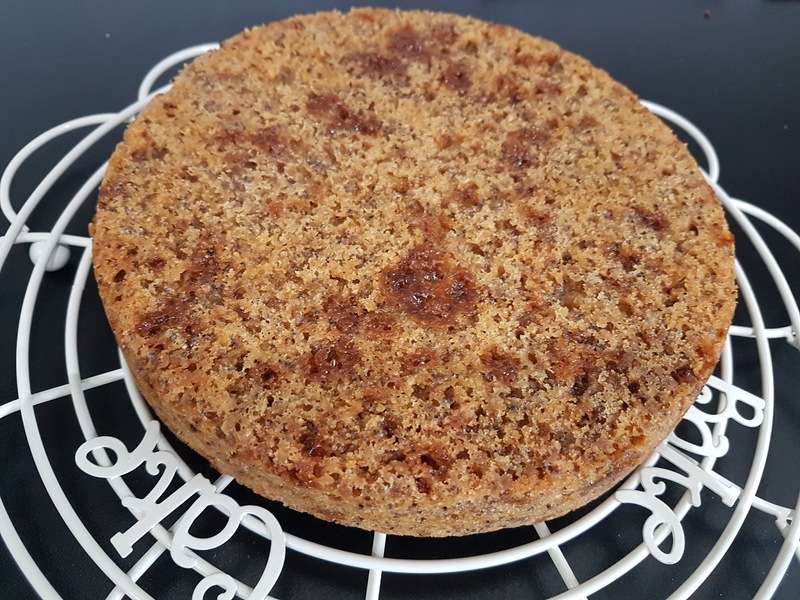 I used 90g of wholemeal flour and 90g of self-raising flour. 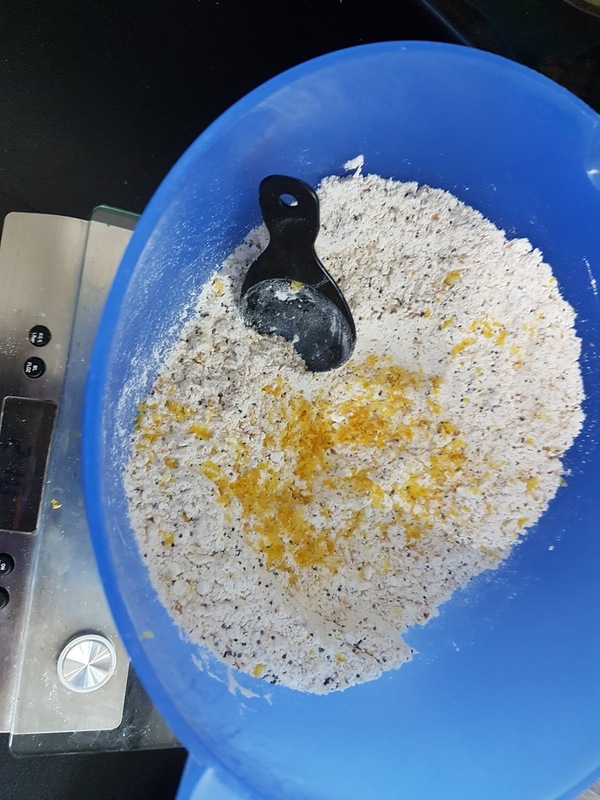 Add in 1.5 tsp baking powder, half a tsp of bicarbonate of soda, pinch of salt, 1 tbsp poppy seeds (around 10g) and 2 tbsp of lemon zest. Then it is a case of quickly mixing the dry ingredients into the wet and getting it into the oven. 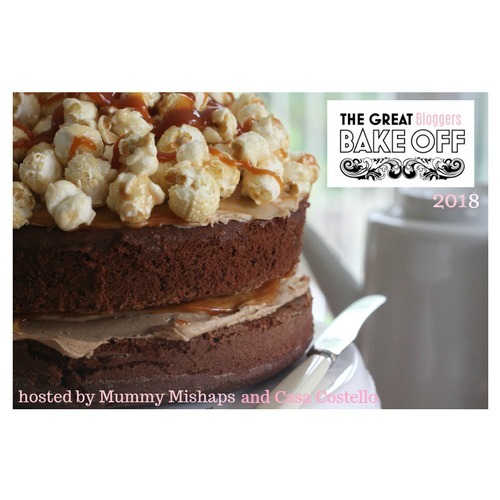 I remembered from watching GBBO that this stage needs to be quick as the bubbles are made as the ingredients are combined. So I guess in this case it will be the acidic lemon juice reacting with the baking powder and bicarb. I baked it in a pre-heated oven at 180C for 30 minutes in a greased and lined silicone baking tin. Then it was time to put the aquafaba to the test! Sure enough it did whip to stiff peaks. I used 140g aquafaba liquid mixed with 70g of maple syrup. I had intended to include half a teaspoon of cream of tartar as that is supposed to stabilise the mixture but I forgot until the end when I quickly whisked some in. It really is a case of whisking this stuff for ages - I think it was over 10 minutes on full speed but I was pleased it got there in the end. The original plan was going to be to use the aquafaba marshmallow fluff to decorate the cake with but I was just concerned if it reverted back to being runny that it could ruin the cake. So I decided to serve the marshmallow fluff alongside the cake and not on it. The cake turned out amazing! It's not much to look at and I was worried about the darker patches which hadn't mixed in properly but it smelt so lemony and tasted great. I actually stirred in a teeny bit of sicilian lemon extract into the marshmallow fluff to keep the lemony vibe going throughout the whole thing. 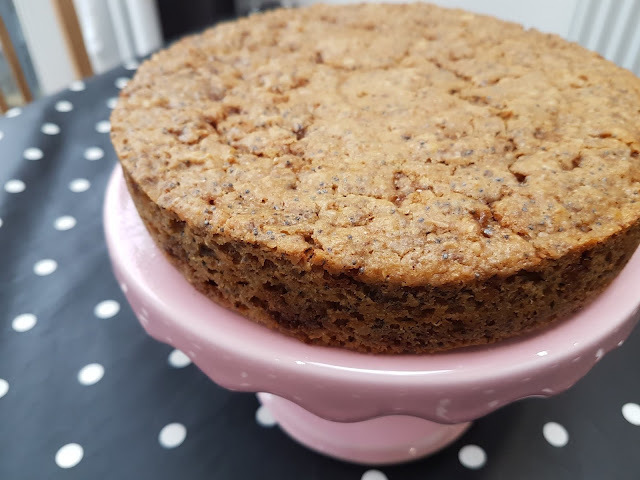 It's definitely not very often that I blow by own trumpet, but I was really pleased with the taste and texture of this cake. Of course, it's mainly thanks to the original recipe that I found and adapted so I can't really take credit for it turning out so well. So there we have it...Vegan lemon and poppyseed cake and vegan marshmallow fluff that doesn't look so great but really does taste great! 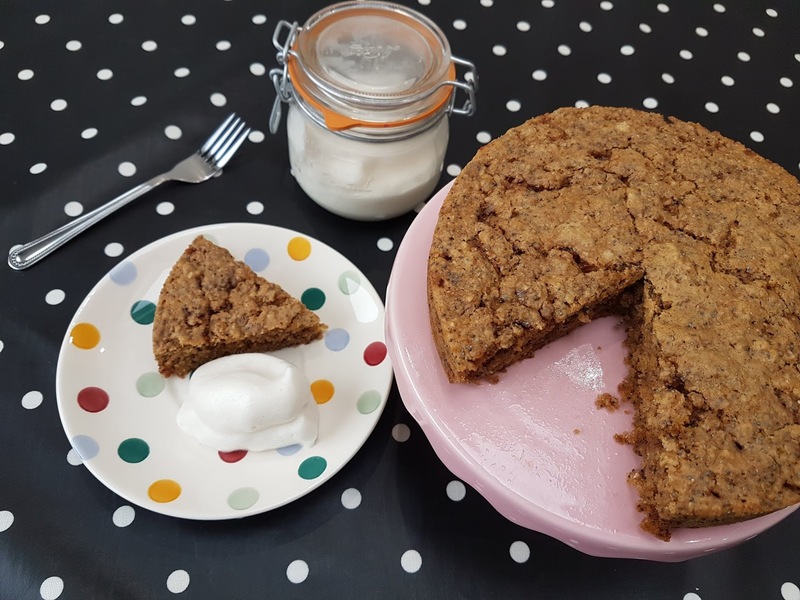 The thought of 'vegan' baking fills me with fear but actually it just involves not using dairy, eggs etc which I often avoid in my bakes anyhow. I've not been eating meat or fish at all since May this year so that has become second-nature to me to not include those things in cooking. The poppy seed cake looks great, and I love the addition of the vegan meringue fluff. After tasting the vegan fluff I realized that will appear in a lot of desserts from now on.